About six years ago, the die-casting company AB Lundbergs Pressgjuteri chose to invest twofold when they hired their new tool manager Mattias Melin and at the same time started their collaboration with NovaCast and their simulation program NovaFlow&Solid. Today, Mattias works with this simulation program on a daily basis, which has helped improve Lundbergs’ entire enterprise. The idea behind NovaCast’s simulation program is to get your project right from the start. By simulating a casting in your computer, you can see right away if defects are bound to occur, and this allows you to repeat the process until you have a tool which, without a doubt, will deliver precision. This way, both time, money and environmental impact benefit. Now everyone involved in the process are satisfied with the end result. For Mattias Melin, the daily work with NovaFlow&Solid consists mostly of problem solving. 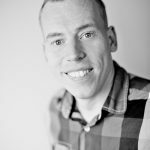 Both at work and in his personal life, Mattias is the kind of person who enjoys both the practical as well as the technical aspects when looking for solutions. According to Mattias, CEO Cajsa Lundberg often compares what the company does to making waffles. Here, the tool is the waffle iron, the batter is the aluminum which gets its shape from the waffle iron and the release substance is the butter. And just like making waffles, in the die-cast business you want each and every one to come out looking great, consistently. Mattias makes good use of NovaFlow&Solid in the process of creating new tools, or when old ones malfunction. AB Lundbergs Pressgjuteri has worked with an international retail company, among others, where they made brochure holders. In this case, the simulation program helped show that if the tool was built as originally planned, the result wouldn’t have met the standard measurements required. The challenge was to cast six identical details at the same time, where each round would take about a minute to cast. But because of the details’ tenuity, the exact right amount of heat had to be applied so that no detail would freeze or harden too soon. And when the client contacted Lundbergs, Mattias could easily show them this process with NovaFlow&Solid, easily explaining problems, challenges and solutions. Because the client was open to discussion and making changes, they were able to find a solution that favored everyone involved. But Mattias uses NovaFlow&Solid in other ways, too, often to predict future challenges.